Ethidium Homodimer I, first developed by Dr. Le Pecq and his colleagues, is a high affinity fluorescent nucleic acid stain. It binds to both DNA and RNA in a sequence-independent manner and with a >30-fold fluorescence enhancement. The DNA binding of each Ethidium Homodimer covers four base pairs and is believed to occur by intercalation. Because the dye is highly positively charged, it cannot cross cell membranes to stain living cells. It is useful for detecting nucleic acids in solution, or for selectively staining dead cells with damaged plasma membranes. 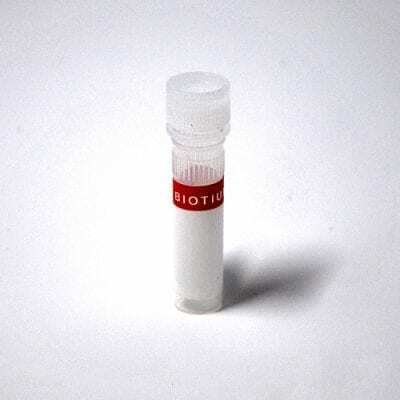 Biotium also offers Ethidium Homodimer I in solid form (catalog no. 40010). Also see Ethidium Homodimer III, which was developed by Biotium as a superior alternative to Ethidium Homodimer I. The absorption and emission spectra are similar, but EthD-III is 45% brighter. EthD-I is dead cell specific in all cell types, including mammalian cells, bacteria and yeast. See our Cellular Stains Table for more information on how our dyes stain various organisms.